Deep in December it’s nice to remember, although you know the snow will follow. Deep in December it’s nice to remember, without a hurt, the heart is hollow. It’s not too deep in December yet, but it is far enough into the holiday season to, well, to remember yuletide seasons of the past, as most adults tend to do when thinking of the joy of childhood Christmases. Before I do that, though, I want to note that this is my final monthly column for Zenith City Online, as it shifts to a more relaxed publishing schedule. I’ve been Zenith City’s western Duluth correspondent since the beginning, designated that because it is the neighborhood of my childhood and youth, my upbringing and education. I’m a Denfeld Boy. It’s been an interesting ride, writing monthly about some aspect of western Duluth over the years, the columns weighted heavily to the West End, the actual neighborhood of my past. Duluthians of today know the West End is now officially called Lincoln Park, and, to some, West Duluth is known as Spirit Valley. I’ve learned some things I didn’t know about the history of the neighborhood where I spent the formative years of my life…many things, come to think of it. But today I will revert to a bit of personal history with a reminiscence of the Christmas season in the West End church in which I grew up. 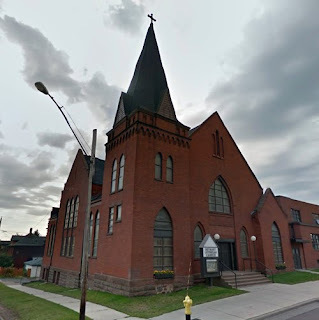 The West End and West Duluth are replete with churches of most Christian denominations. Each one, I know, had Christmas traditions fondly recalled by those who experienced them as children. Before attaching that column, let me say I’ve enjoyed writing for Zenith City Online these past several years, and appreciate having been included. I continue to operate a blog—jimheffernan.org—on which I write on a variety of subjects from time to time. (The previous writing was my introduction to my final monthly post on Zenith City Online.